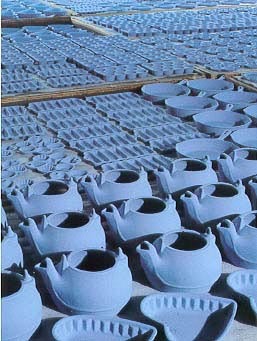 Shown above, tea kettles, trivets, muffin pans and skillet cookware that has been coated and dried, waiting for the next step in the process, the furnace. Whether it's a rush job, a large production run, or a unique application, IPE can handle it. Since 1922, IPE has applied its porcelain enamel coatings to a growing number of industrial and consumer products - from pump bowls and flanges to cookware and stove tops - in a wide range of colors and surfaces. Since it's beginnings, IPE was founded on the principle of quality workmanship with reliable, dependable service. Now as a subsidiary of GFE, IPE continues this enduring commitment to its customers. IPE handles a wide range of surface applications. Pneumatic conveying tubes, signs, pumps, engine intake and exhaust manifolds, flanges, and foundry hoppers are some of the products. We also provide appliance refinishing service. 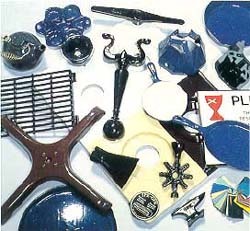 Shown on the right is a sampling of parts that can be coated with durable porcelain enamel. Items include cast iron cook ware, appliance panels, burner grates, grills, signs, automobile intake and exhaust manifolds. The coating is also used in industrial applications for pneumatic conveying tubes, vertical turbine pumps (aka bowls) and impellers.